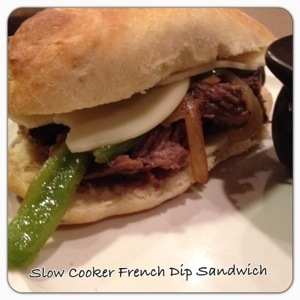 This French Dip is seriously so delicious! It’s the perfect sandwich for the busy mom who needs to get a great easy meal on the table. All the hubby could say was WOW! I’m totally making this again for the family. Trim excess fat off of beef roast and season meat all over with salt and pepper. 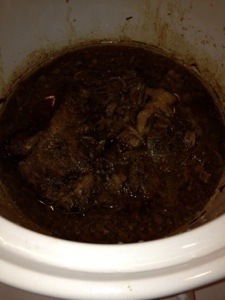 Pour beef broth, condensed French onion soup, red wine and garlic powder into slow cooker and place beef roast into liquid. 8 hours. You don’t have to worry about the meat drying out in the same way you might if you were roasting the meat in the oven. Mine took 7 1/2 hours and was falling apart tender. Take beef out and rest it, covered with aluminum foil, for about 15 minutes. 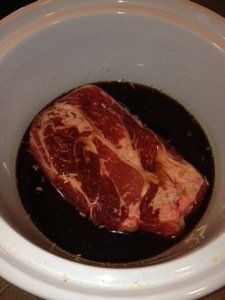 Slice beef and return to slow cooker on low or very low for 30 minutes. Lightly toast the bread and evenly distribute cheese between rolls. I also sliced and cooked a bell pepper and onion. 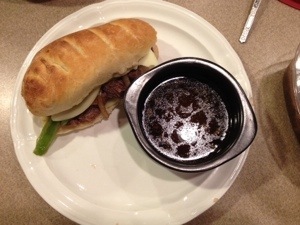 Divide beef onto rolls and spoon the beef juice into small bowls and eat everything while it is hot. Serve each sandwich with its own dip. Serves 4-6. Enjoy!